Kambaku is the ultimate escape from busy schedules, with eight well appointed thatched chalets overlooking an active waterhole. 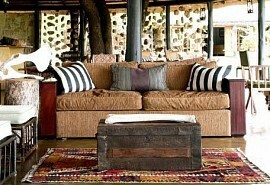 Kambaku Safari Lodge combines simple luxury with scrumptious bush cuisine in a relaxed, rustic setting. Guests can truly unwind and immerse themselves in the restorative powers of nature. 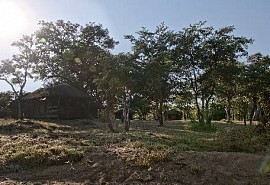 Kambaku is a great safari destination for families. Morning and afternoon/evening game drives are offered in open safari vehicles, accompanied by experienced rangers who will help you track the Big Five. Kambaku also offers guided bush walks where guests are exposed to the smaller creatures, as well as tracks and other interesting wildlife that generally is missed while game viewing from a vehcile. 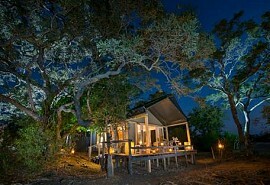 The Timbavati Game Reserve consists of 53,392 hectares of private game reserve land adjoining the Kruger National Park. Presently there are over 40 mammal species in the Timbavati private game reserve, including the Big Five of Lion, Leopard, Rhino, Buffalo and Elephant as well as 360 species of bird life. The Timbavati Game Reserve is located in the Limpopo province of South Africa.